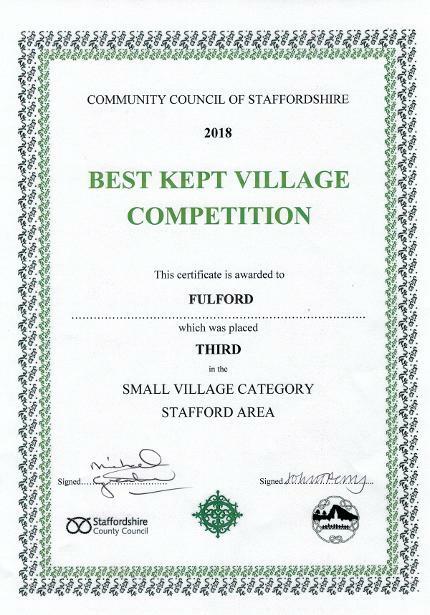 Fulford Village has achieved THIRD PLACE in the Small Village category of Stafford Area in the finals of the BKV 2018 competition. Fulford is a small to medium working village in the heart of Staffordshire, located to the east of Stoke-on-Trent. With an active village and farming community, we are proud to take part in the Best Kept Village competition and organise regular events, including an annual Fulfest music festival, and monthly walks from autumn through to spring (including a rhododendron walk and an infamous dawn chorus walk). Social activities for the Village. Fulfest (an annual local music festival). Improving communication with and supporting all community organisations. Footpath walks and improvements to the footpath network. Thank you Fulford. We have done it! A huge THANK YOU to everyone who has donated. As well as the traditional village fete and weekly pub quiz, we are still looking forward with such ideas as a community village garden, and a range of village social events. We are always looking for new additions to our numbers, so if you have any ideas or just like an excuse for a drink in the pub on a Tuesday, please contact us either through the email or the secretary on the contacts page. We also publish a village newsletter - the latest edition appears below. The Inaugural General Meeting of the Fulford Village Group (FVG) was held at Fulford Village Hall on Tuesday 16th December 2014 at 7.30 pm at which the Constitution of the Society was approved and adopted and the Officers appointed. See the pictures of the BKV events in the PHOTO GALLERY!